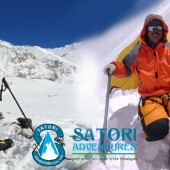 Satori Adventures (P) Ltd is composed of highly experienced and qualified high altitude climbing Sherpa who have years of operating experience in Himalayan mountaineering. Our staffs of climbing sharps and porters are trained in first aid as well as basic and dvancesearch and rescue through courses that are run by the Nepal Mountaineering Association. A qualified climbing Sherpa guide can enrich your travel and climbing experience in many ways and ensure safety on your adventure during your trekking and climbing periods. Having a guide on your Himalayan adventure is a huge advantage, our guides will set up all of the logistics, carry your equipment, set up base camp, and the climbing camps, fix all the ropes, help with your backpack when you are struggling, show you places that you would have never even thought about, introduce you to the local culture, geography and flora/fauna. Satori Adventures makes sure that our guides are capable of making correct decisions in critical situations. Our aim is to ensure that our Associate Guides have excellent practical experience in climbing techniques as well as providing trekking, base camp and high camp logistics. We are working on training programs to improve information services provided by our guides in the area of history, tradition, culture and religion to help our guides communicate information to our customers, vastly improving the value of our service. We are also providing opportunities for Nepalese women to guide because we believe in the empowerment of women. It is a struggle to make most western climbers feel comfortable with a female guide; they tend to favor male guides. We are constantly looking for customers and particularly female customers, who are prepared to accept women as their guides. All of our climbing guides have thorough technical training and practical experience in rock climbing, ice and snow climbing, and logistics. All of Our Sherpa guides are qualified and experienced enough to setup high altitude camps and have intimate knowledge and experience in high altitude camping. Satori climbing Sherpa guides are experienced in all technical mountaineering systems including but not limited to: Fixing rope, technical lead climbing on ice, rock and snow terrain, belaying and high angle rescue situations. Fully trained and experienced in the use and instruction of supplemental oxygen, mask regulators, preparing high altitude food, avalanche and High Mountain rescue techniques. Our climbing Sherpa guides have experience on several 8000m summits, setting-up climbing routes, fixing lines and helping many western guides and climbers to the summits. Most of Satori climbing Sherpa Guides has summated Everest a minimum of 2x and a maximum of 15x. Satori guides have operated on Shishapgmana, Manaslu, Everest and Cho-Oyu in both spring and autumn seasons. K2, G2 and Broad peak in the summer season. All of our guides are certified by the Nepal Mountaineering Association. All guides have certified skills in first aid, altitude/mountain sickness prevention and rescue protocol training. The guides employed by Satori Adventures are people with a proven track record of honesty and personal integrity and are committed to climbing practices that do not cause adverse environmental impacts. Satori Adventures has guides available that speak several different languages ranging from: English, Italian, German, Spanish, French, and Japanese. Our climbing guides have in-depth knowledge about all types of climbing, local culture, local customs and local religions and are keen to share their knowledge with their clients. What to expect with Satori? When you arrive at base camp our staff and high altitude trekking guide/porters will set up the camps and while you rest, recover and continue to acclimatize. Upon completing a Pooja ceremony at base camp, our team of Sherpa’s will begin to open the route to camp I. When this is completed, our guides will begin to take clients and loads to camp I. Depending on your physical fitness and bodies’ reaction to altitude, you may stay at camp I for a second night, or move up to camp II and then descend back to base camp. Our climbing guides will then open the route and fix lines to camp II, equip the camp with gear, equipment and food. If time is required for acclimatization and if the weather conditions allow, you may sleep a second night at camp II, or proceed up to camp III and then return back down. During your rest and time at base camp our team will continue to open the route, fix the camps and supply food, oxygen, and equipment for the summit push. Depending on the height of the mountain our team will fully equip camp IV with food and oxygen and make sure that the clients are fully acclimatized before attempting the summit push. Our climbing Sherpa guides will always prepare and serve hot water, tee/coffee/tang juice, breakfast, lunch and dinner above the advanced base camp. Our guides take full responsibility of all activities on the climbing route. They cook, serve you food, carry your supplies and motivate you when you get tired. After you acclimatize through camp I, II, III, IV (as per the height) our climbing guides will check the weather forecast, group fitness and recovery conditions. If upcoming weather reports, your physical fitness and conditions are good, they will give the all clear to begin the summit push. On the summit push, you will move to camp I, camp II, camp III and then camp IV before moving to the summit. At camp III or IV you will wake at 10:00PM to 01:00AM to begin the summit push. If due to any reason (bad weather, group physical fitness, accident, incidence) you have to return to base camp before the summit push, but still have climbing time, good weather conditions and climbers are interested for another summit push, our climbing Sherpa will provide one more opportunity. However, more than 98% of climbers either summit on the first try, or give up the trip after the first summit attempt.